The site I’m working on has a nice sturdy grid underpinning the page layouts. Before opening up a text editor and marking up the structure, I plotted each grid variation on graph paper. That helped me figure out the range of variation in layout possibilities. But if I wanted to try a new variation, I’d have to draw a new sketch. 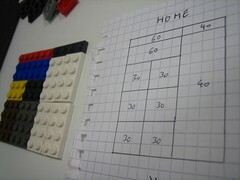 That’s when I reached for a new design tool: Lego. Think about it: they’re pre-structured into consistently sized chunks that can be easily combined into different combinations: perfect for messing about with grid layouts. Or I might have been procrastinating, playing with Lego when I should have been tied to my keyboard. In either case, the Lego phase is behind me. Now I’m in the tippety-tap, edit, save, tab, refresh phase. I’m pretty excited about this site and not just because of its griddy goodness. This is a site that I can see myself using. To oversimplify, it’s a social network based around setting personal goals to improve environmental responsibility. Given the ridiculous amount of air travel I’ve indulged in over the past year, my goals might have to involve planting a forest. The site is called Edenbee. There’s just a holding page up for now (that’s rapidly becoming Paul’s speciality). If it sounds like the kind of thing you might be interested in, pop your email address in there.